There are a couple of reasons why I like this method of making long grass over products specifically designed for this purpose. Using this method you can make the grass any color you want. You can also make the grass longer than all of the grasses I saw designed for this purpose; you could easily make it over the head of a Space Marine if you wanted to. 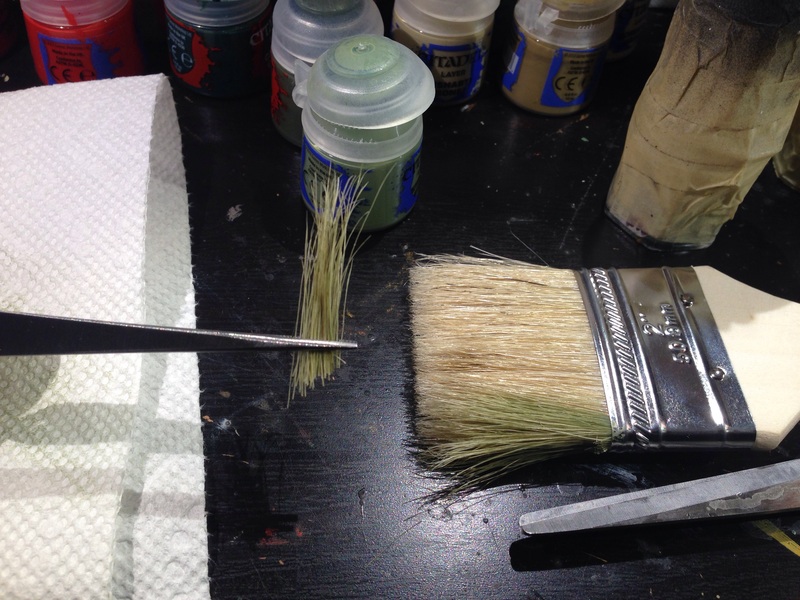 The brush bristles I used are also quite durable and stands up well to the rigors of wargaming. 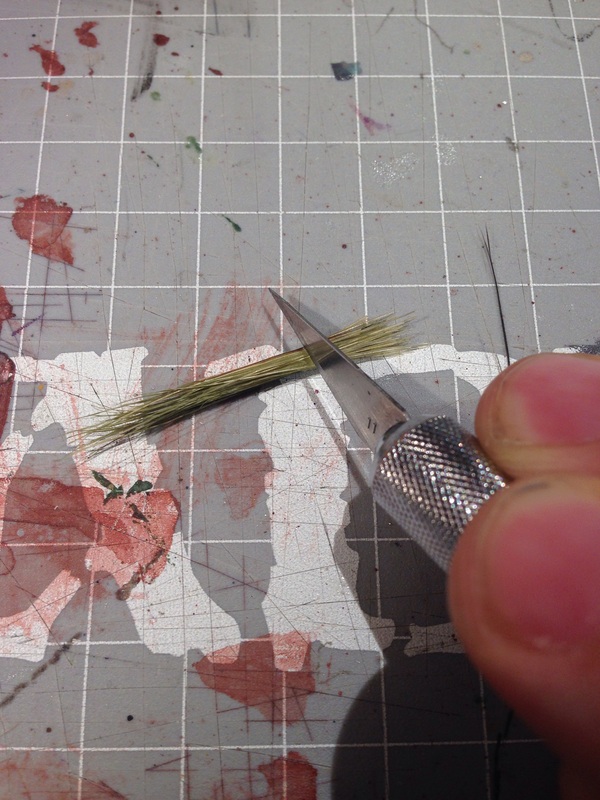 The last aspect of this method of making long grass that I know most hobbyists will appreciate–this method is incredibly inexpensive, I had almost everything I needed already sitting around my hobby room and the things I didn’t have already cost less than $5. 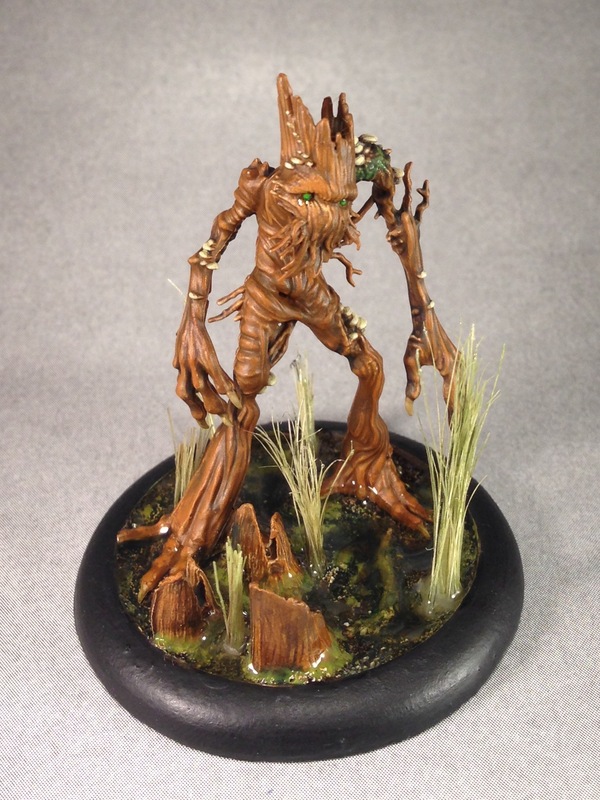 The models you will see in my example photos are Waldgeist from Malifaux and the bases are Blasted Wetlands resin bases from Secret Weapon Miniatures. 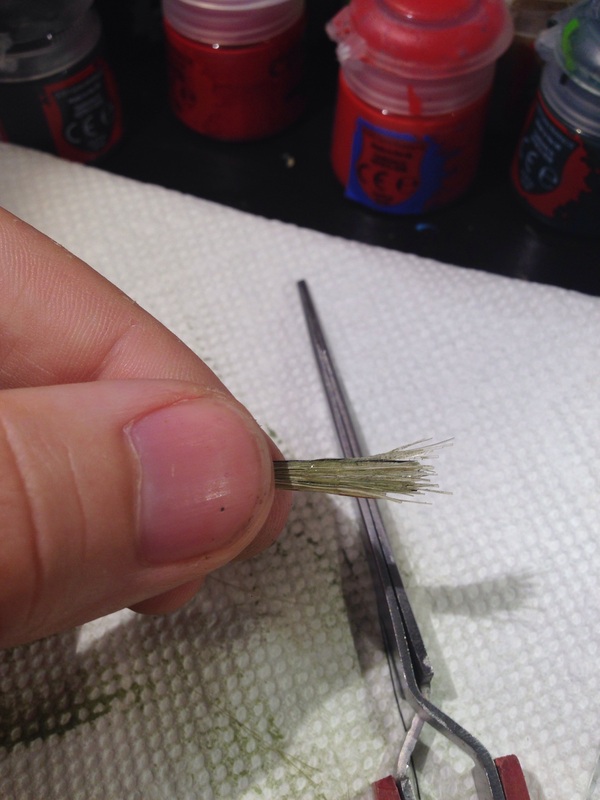 Painted model and base you are putting long grass onto–Similar to using flock for short grass on bases, this is the final step to completing your model and should be done after the base and model have been painted so that you don’t mess up the grass. 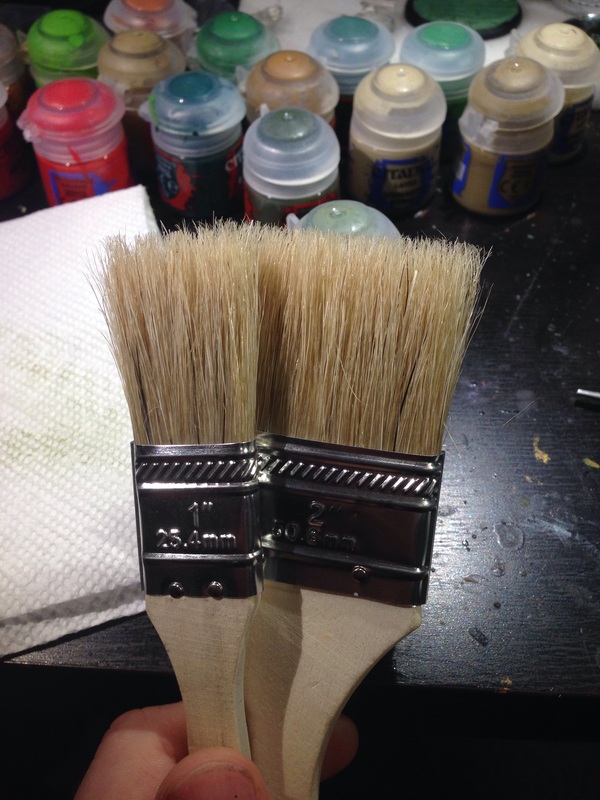 Large cheap natural bristle flat paint brushes–You can find these at any craft or hardware store, I grabbed mine at Michael’s. Paint–I told you that you get to color your grass however you want! You can even do some crazy purple grass for some weird alien world if you want. You’ll need a couple of shades of paint in the spectrum you want your grass to be so that you have some variation in tone. 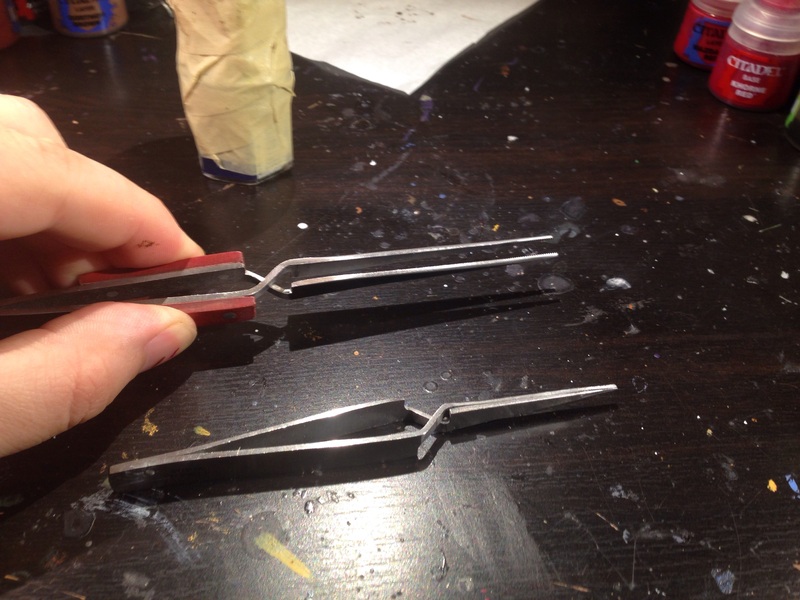 Tweezers–I recommend 1 pair of regular tweezers and 2 pairs of reverse tweezers. The regular tweezers are handy for tweaking the final positioning of your grass. If you don’t know what reverse tweezers are, I’ll show you in a moment. Super glue–Thin or thick works well for this. 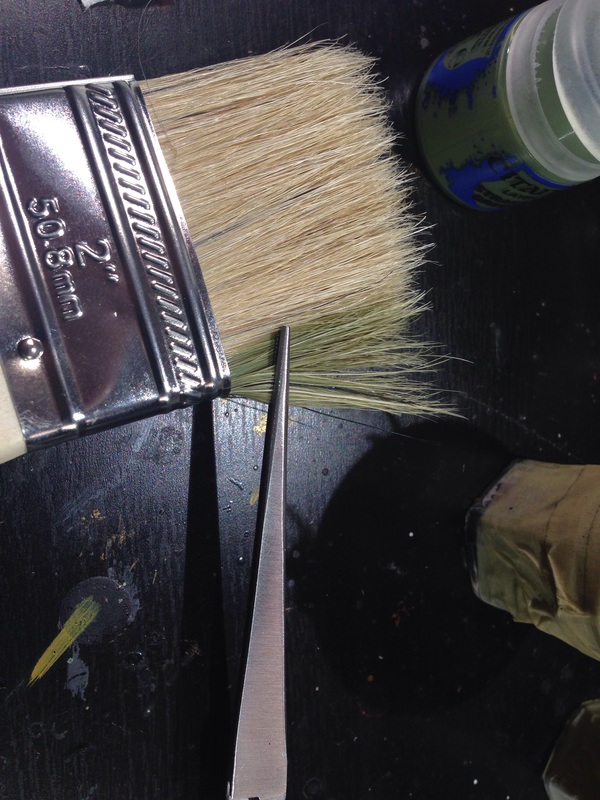 PVA glue–Plain old white glue; the same stuff you use to put sand or flock onto a base. For those of you who are visual learners, these are the kind of cheap brushes I mentioned above. I got them in a three pack for less than three dollars. The important thing is natural fibers because then the color in them isn’t perfectly uniform which gives you a more realistic look to your grass, and you can easily stain the natural bristles to match whatever spectrum you want. These are what I mean by reverse tweezers; reverse tweezers vary from regular tweezers in that you squeeze them to open them. They are really great for holding onto something while you are working on other things. Now we being! Get some paint on the bristles. 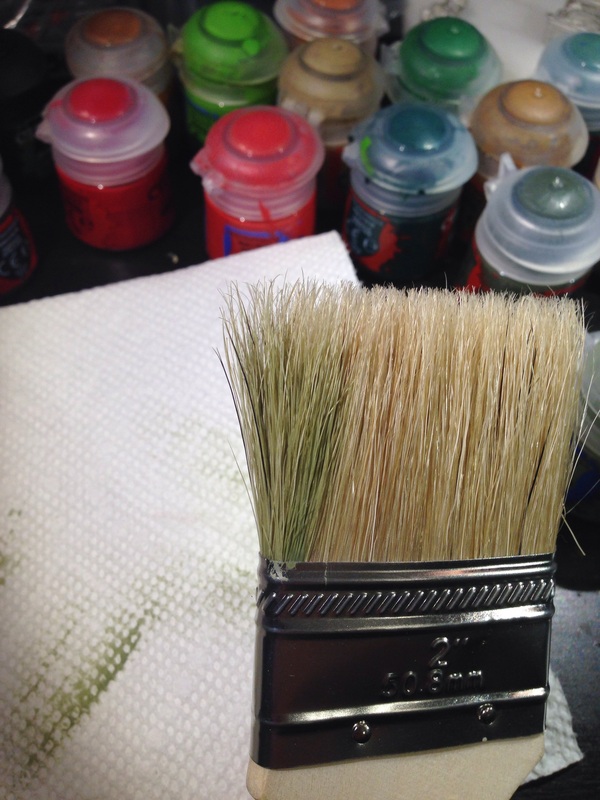 You can work some inside the brush to the inner bristles with an older brush which is reaching the end of its useful life that you used for painting minis. Brush off the excess paint from the large brush onto a paper towel like you are drybrushing, this will keep the bristles from sticking together but stain the bristle to the color you want. You can do this multiple times with multiple colors until you get the hue you want. Separate some bristles and hold them with your reverse tweezers. Bend the bristles down away from brush so that you can cut them off the brush without cutting bristles you don’t want to cut yet. Use your scissors to cut off the bristles you’re holding in the reverse tweezers. Twist the bristles together slightly into a bundle around where the bottom of the length you want your long grass to be. If you have too many bristles, you can separate out some of the bristles (it’s handy to use your second pair of reverse tweezers to hold onto the second bundle while you work on the first). 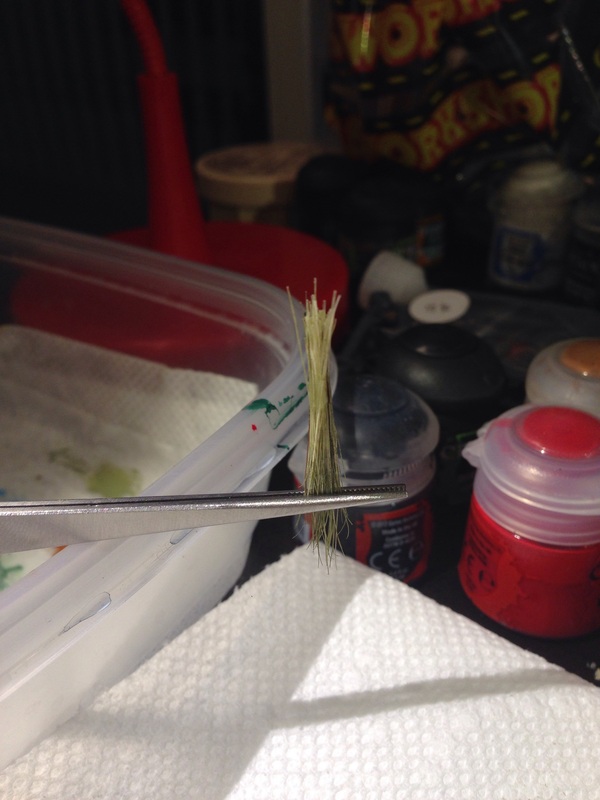 Drop a dab of super glue on the middle of the bristle bundle around where you want the bottom of the grass length to be. Make sure the glue soaks into the bristles through the full thickness of the bundle at that point and all the way around it there. Leave your glued grass bundle still gripped in your reverse tweezers off to the side to dry while you work on another grass bundle. If you are doing a whole army with this basing or making a field of grass, getting into an assembly line type groove helps this go faster. 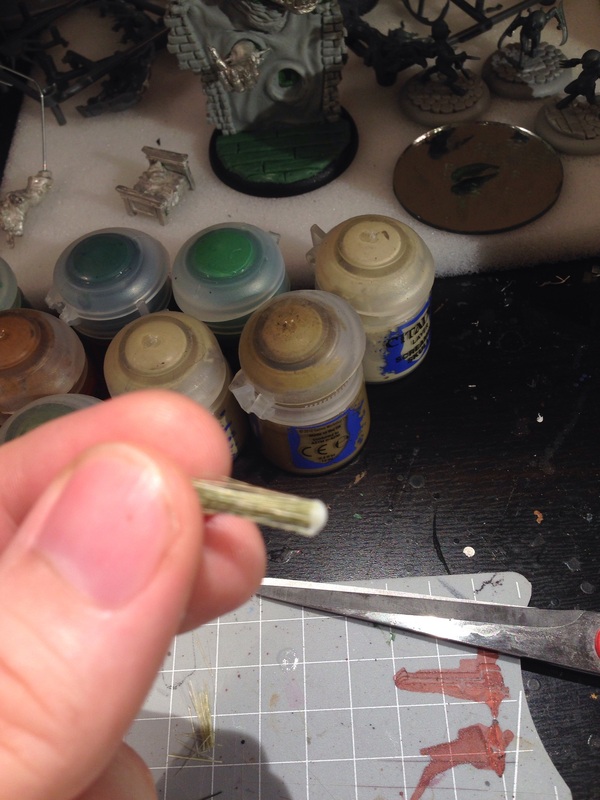 Once the glue on your bundle is dry, cut through middle of dried glue ball with your hobby knife. Now your long grass tuft is ready to add to a base! You can use the cut off portion of the bundle as another tuft, you just have to trim the loose ends to be less even so as to look more natural. Now it’s time to glue your tufts to base! I recommend letting a small puddle of glue sit out for a bit to get a little tacky. 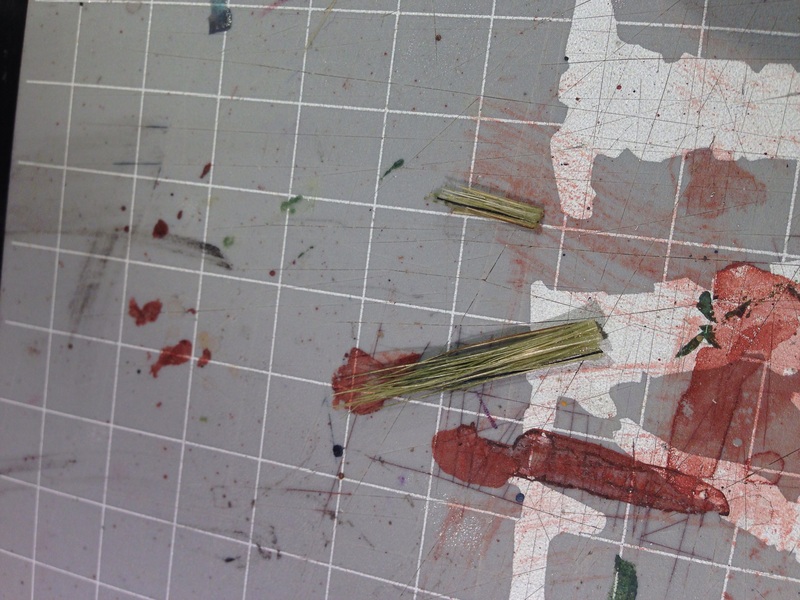 Take your grass tuft, dip it into your puddle of glue, and then put your tuft onto the base. You can use super glue for this, but it can frost up on the base and the bristles. Add as many tufts to your base as you need! In this marsh I only wanted a few, but you could use this method to make an entire grassy field. Once the glue has dried you are done! 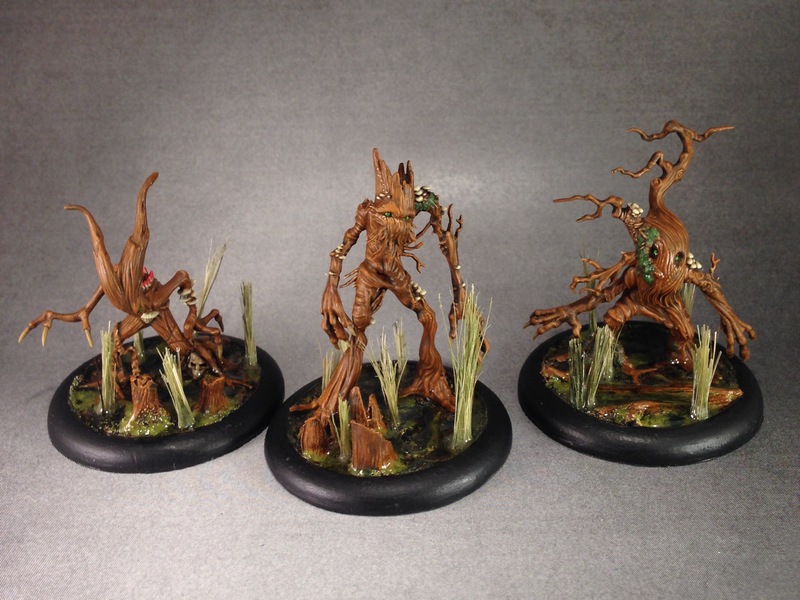 For bases with soil basing you can mound up some sand or texture paint around the base of your grass tuft if you want or even add a little flock around it. In this picture you can see what the base looks like once it’s finished. 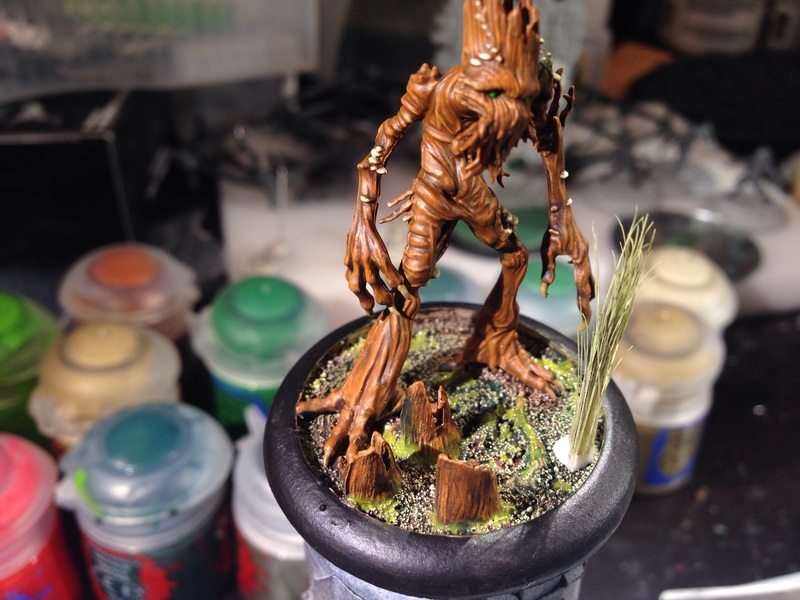 After the glue on the grass dried, I added a few layers of water effects to the base. I really like how the grass looks growing out of the swamp water. Enjoy your new-found superpower to control plants! I hope this tutorial helps you out!